Who knew that Good King Wencelas even had an automobile! The song doesn’t say if he was drive a fuel efficient vehicle or if it was an SUV, but the dude needs to check his mirrors and check them twice. Poor Steven, I hope he had good medical insurance to cover the repairs on the “piece” that got run over! One thing I do know, that if this happened in our day and age Good king Wencelas would certainly be sued and probably would lose his crown in the process. Perhaps next time he will just have one of his loyal subjects drive him instead…that is if he has any loyal subjects left after the dust settles on the legal suit! I kid you not, nothing irritates me more (in real life) than drivers who either aren’t paying attention or are simply inconsiderate to other people. I have to calm myself down when I see drivers who are holding their cell phones in front of them while they are attempting to drive. I will admit from time to time checking my status at a red light, but seriously while driving in heavy traffic around town (or anywhere for that matter) – not cool! Hopefully Good King Wencelas wasn’t on his cell phone poor Steven got run over. Oh the joys of Christmas, and yule tide cheer…you have to enjoy while it lasts! Christmas can be really special if you slow down long enough to laugh a little bit and take in the true meaning of the season. Maybe watch some Christmas movies to help, go caroling with a church group, make some Christmas cookies (by the way send me some if you do!). 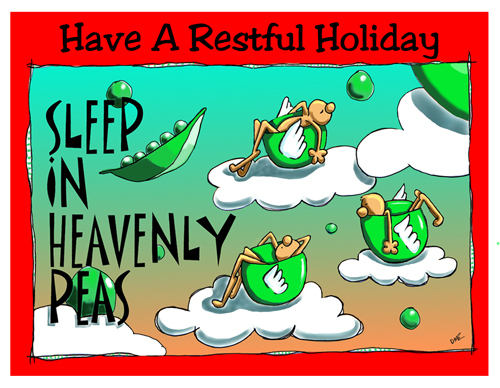 “Sleep in heavenly peas…” See, perhaps Veggie Tales hasn’t cornered the market on french peas…there’s a heavenly place filled with peas to prove it.